According to a publication advertisement, the collection Two Scottish Tales of Medical Compassion: Rab and his Friends & A Doctor of the Old School, with A Brief History of the Edinburgh Medical School (2011) sets out to illustrate ‘how the Edinburgh principles of compassion furthered the science of medicine’.1 The advertisement presents these tales and ‘the lessons they teach’ as ‘valuable tools for any modern physician to rely on’. The ‘Brief History’ provided by Dr John Raffensperger, Emeritus Professor of Surgery at Northwestern University, highlights the key role of the scientific surgeon in Edinburgh medicine. The progressive endeavour through the nineteenth century to make surgery both safer and less painful, forwarded by Edinburgh surgeons such as Robert Liston (1794–1847), who in 1846 became the first surgeon in Britain to operate using ether vapour, James Syme (1799–1870), who initiated the practice of providing surgical teaching in the operating theatre, and Joseph Lister (1827–1912), founder of a revolutionary system of antiseptic surgery, are presented as not only driven by their scientific practices but also by their compassion for their patients.2 According to Raffensperger, Sir James Young Simpson’s discovery and popularisation of the anesthetic properties of chloroform was driven by his unremitting desire to mitigate the agony of surgical patients after he witnessed a breast amputation performed by Liston. The message is simple and effective: compassion can drive extraordinary innovation. This is obviously all very well meant. However, when I first came across this book while writing a public lecture for the AHRC-funded series of events, Dissecting Edinburgh: Literature and Medicine in the Scottish Capital, which I intended to close by examining Edinburgh medicine’s place in the modern Medical Humanities movement, my thoughts ranged from initial thankfulness for such a clear example to, upon reflection, concerned scepticism. A Doctor of the Old School is extracted from Maclaren’s Beside the Bonnie Brier Bush (1894)—one of the most representative texts of the Scottish Kailyard School of writing. As Andrew Nash’s recent monograph, Kailyard and Scottish Literature(2007) outlines, nearly from its inception in the 1890s, critics have used the term ‘kailyard’ to denote the wrong way of writing about Scotland—to characterise an immensely commercially successful group of novels which were overly sentimental, nostalgic for a lost age, and in their depictions of idyllic rural settings where religious piety and morality rule, totally out of touch with actual life in Scotland at the turn of the nineteenth century. ‘Kailyard’ novels are thus seen as responsible for propagating a false image of the Scottish nation. Now, to the uninitiated, according to the Medical Humanities Research Centre within the School of Critical Studies at the University of Glasgow (of which I am a part), the ever-growing field collectively termed the “Medical Humanities” is intended to ‘complement, contextualize and critique purely biomedical, technological or other reductive accounts of what it means to experience illness, encounter disease or transact a therapeutic relationship’. Literary criticism looms large in this wider project, particularly in my own current work, in which I turn to the literature of the nineteenth-century periodical press in an attempt to understand the historic relationship between medical and literary cultures in Scotland. So, for me, the key question then becomes, do we really want one of Scotland’s distinctive contributions to the Medical Humanities movement to be the “medical kailyard”? My answer is a highly conditional maybe. Nash’s monograph has made important strides towards justifying critical engagement with the kailyard that moves beyond immediate denigration. His work encourages critics to re-access the substantial output of novelists such as J. M. Barrie, S. R. Crockett, and Maclaren on their own terms and not just as adhering to the codes of a supposedly diseased literary school, which both infantilised Scotland and, according to Gillian Shepherd’s earlier assessment, through its key authors’ increasingly patronising portrayal of stereotyped characters, attempted what might amount to ‘national infanticide’.5 An important aspect of Nash’s revision is the realisation that writers in the Kailyard School were not attempting to depict a realistic version of Scottish rural life. Rather, as Thomas D. Knowles indicates, the Kailyard was ‘a commercial and ideological phenomenon designed to promote a moral ethos’ and to counter the “ungodly” literature of Zola, Wilde, and Ibsen in the 1890s.6 Nash builds upon Knowles’ assessment, arguing that the term “realism” was applied to Kailyard writing by contemporaries, not in the sense of ‘accuracy of sociological representation’ but in relation to ‘mid-Victorian ideas of sympathy’, in which a literary work’s ability to arouse feelings of sympathy in the reader was thought to indicate a shared moral code between author and reader.7 In the case of Maclaren, his “realism” is part of an attempt to build a ‘Godly Commonwealth around a structure of feeling that is conveyed through a deliberately sentimental strategy’.8 A similarly nuanced contextualisation must take place for the “medical kailyard” if we wish to take this literature seriously. Much more needs to be said to justify my contention that the term “medical kailyard” may be applied to more than just the singular example of A Doctor of the Old School, and I do not have space to say it all in this short, intentionally discursive article. However, both A Doctor of the Old School and ‘Rab and his Friends’, in their portrayal of sentimental deathbed scenes, in their episodic nature, their emphasis on feeling and intuition, and their morality and religious piety, build upon what J. H. Millar terms the ‘pure “Kailyard”‘ of John Wilson’s Lights and Shadows of Scottish Life (1822), chapters of which were first published in Blackwood’s Edinburgh Magazine.9 Writing to William Blackwood, in an undated letter most probably from 1822, the surgeon and writer, David Macbeth Moir (1798–1851), suggests that in finishing Wilson’s text, ‘The visits of a Country Doctor to his patients might also afford some traits of humourous peculiarity.’10 This appears prophetic of A Doctor of the Old School, but also looks forward more immediately to Samuel Warren’s series, Passages from the Diary of a Late Physician, first serialised in Blackwood’s from 1830 to 1837, which focuses on a London physician, rather than a ‘Country Doctor’, but incorporated the sentimental deathbed scene into a literary text structured as a series of medical “case histories”. Not unlike the Kailyard literature of the 1890s, Brown’s tale is driven by a reactionary moral ethos. Rather than affirming an actual widely held contemporary valuation of “compassion” within Scottish medicine, the tale works against what we today term “clinical detachment”, while also paradoxically affirming its utility. The message of this particular text appears to be that despite appearances, physicians, carriers, and extraordinary dogs can still feel. More broadly, throughout his corpus Brown writes against what he perceived to be the ever-growing dominance of scientific medicine in the nineteenth century. If we are to engage with his literature, we must read it in this reactionary context. Throughout the essays comprising Horæ Subsecivæ, Brown continually returns to the importance of wider literary culture for the medical practitioner. For example, in an essay ‘On Mental Training and Relaxation in the Study of Medicine’, first published in the Monthly Journal of Medical Science in 1851 and included in Horæ Subsecivæ under the energetic new title of ‘With Brains, Sir!’, he recommends the study of modern languages, natural history, literature, and classics as providing respite from the intensity of medical study but also as a form of mental training, as a way to ‘invigorate the containing and sustaining mind’ and thus turn thought into action.15 The type of reading he recommends should be ‘a sort of game of the mind, a mental exercise—like cricket—a gymnastic’, and comparing the exercise to running up Arthur’s Seat, he declares ‘you must eat the book, you must crush it, and cut it with your teeth and swallow it; just as you must walk up, and not be carried by the hill’.16 Such mental exercise, according to Brown, will assist one in learning the ‘art’ of medicine, rather than the ‘science’. These twin aspects of medical practice are contrasted in an essay entitled, ‘Art and Science: A Contrasted Parallel’, wherein he defines ‘science’ as relating to ‘information, as equivalent to a body of ascertained truths’ and ‘art’ as implying ‘practical knowledge and applied power’.17 Both are of course deemed necessary, but in ‘Locke and Sydenham’, he writes that his purpose in ‘now bringing forward the works and character of Sydenham, is to enforce the primary necessity, especially in our day, of attending to medicine as the art of healing, not less than as the science of diseases and drugs’.18 While Sydenham, often deemed the “English Hippocrates”, practiced medicine for ‘the glory of God and the good of men’, the modern medical man lives in an ‘age every day more purely scientific, and is occupied far more with arranging subjects and giving names, and remembering them, than with understanding and managing objects.’19 Read within this context, ‘Rab and his Friends’ evinces Brown’s attempt to understand a particularly memorable patient and her unusual family. However, he is writing from the unstable grounds of what he and others present as a lost, or at least, a dying tradition. As Irvine Loudon has aptly indicated in his work on Medical Care and the General Practitioner 1750-1850, A Doctor of the Old School evinces a stereotyped construction of the figure of the traditional family doctor. He concludes that this figure ‘has suffered on numerous occasions from an excess of sentimentality in the memoirs and after–dinner speeches of doctors, in novels, and in plays and serials on radio and television.’25 Throughout its history, the medical profession appears to have at times had a certain attraction to the “medical kailyard”. However, like the emotiveness that ends ‘at best in tears and a long-drawn breath’, this ‘excess of sentimentality’ regarding the history of medical profession can infantilise humanistic medicine and depict it as part of a dying tradition that scientific medicine has already surmounted. 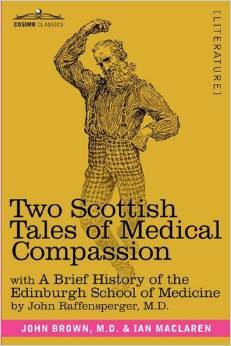 Two Scottish Tales of Medical Compassion, however, may actually rather get it right in focusing upon the ability of compassion to motivate further progress. Rita Charon, in her seminal work, Narrative Medicine, continually returns to the concept of medical practitioners being ‘moved to action’ through an understanding of their patient’s stories, and this concept itself may be seen as having Scottish roots.26 As Lawrence McCullough’s scholarship has evidenced, John Gregory (1724–73) incorporates David Hume’s declaration that ‘Reason is, and ought only to be the slave of the passions’ into his Lectures on the Duties and Qualifications of a Physician (1772), a text widely considered to be the first modern work of medical ethics in the Western world.27 However, in engaging with the “medical kailyard”, one should abide by Brown’s call to do so ‘With Brains, Sir!’ This will mean inherently different things for different reading audiences, but it certainly should not mean reading these texts literally and with nostalgia for a bygone age. For me, it involves working to understand the place of this particular type of writing within the dually rich medical and literary cultures of the Scottish nation, and also realising that this ever-evolving field we are now calling Medical Humanities has a long and complex history itself. Thanks to the Trustees of the National Library of Scotland for permission to quote from a manuscript in their care. This work was supported by the Wellcome Trust [097597/Z/11/Z]. The advertisement may be found here: Two Scottish Tales of Medical Compassion. Basic information about each of these figures may be found in the Oxford Dictionary of National Biography. Two Scottish Tales of Medical Compassion (New York: Cosimo Classics, 2011), p.44. Gillian Shepherd, ‘The Kailyard’, in The History of Scottish literature, 3: Nineteenth Century, ed. by Douglas Gifford (Aberdeen: Aberdeen University Press, 1988), pp.309-20, (p.317). Thomas D. Knowles, Ideology, Art, and Commerce: Aspects of Literary Sociology in the Late Victorian Kailyard (Goteberg, Sweden: Acta Universitatis Gottoburgensis, 1983), p.47, as qt. in Andrew Nash, Kailyard and Scottish Literature (Amsterdam; New York: Rodopi, 2007), p.129. J. H. Millar, A Literary History of Scotland (London: T. Fisher Unwin, 1903), p.511. Letter of D. M. Moir to William Blackwood, 3 March [1822? ], National Library of Scotland MS 4009, fols. 106-7. Two Scottish Tales of Medical Compassion, p.12. John Brown, Horæ Subsecivæ. Locke and Sydenham with Other Occasional Papers By John Brown, M.D. Fellow and Librarian of the Royal College of Physicians, Edinburgh. (Edinburgh: Thomas Constable and Co.; Hamilton, Adams and Co. London, 1858), p.xi. Two Scottish Tales of Medical Compassion p.12. Alexander Peddie, Recollections of Dr. John Brown, Author of ‘Rab and his Friends,’ etc. With a Selection from his Correspondence (London: Percival & Co., 1893), p.79. Two Scottish Tales of Medical Compassion, p. 25. Irvine Loudon, Medical Care and the General Practitioner 1750-1850 (Oxford: Clarendon Press, 1986), p. 278. Rita Charon, Narrative Medicine: Honoring the Stories of Illness (Oxford: Oxford University Press, 2006), p. 4. David Hume, A Treatise of Human Nature, edited with an introduction by Ernest C. Mossner (London: Penguin Books, 1969, rpr. 1985), p. 462; See, Lawrence B. McCullough, John Gregory’s Writings on Medical Ethics and Philosophy of Medicine (Dordecht, Boston and London: Kluwer Academic, 1998), and John Gregory and the Invention of Professional Medical Ethics and the Profession of Medicine (Dordecht, Boston and London: Kluwer Academic, 1998).